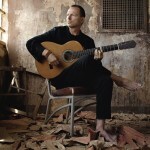 Long-time client and friend Ottmar Liebert just released a beautiful new album of guitar music. It hits stores next week, but the music can be previewed and downloaded as of today from the ListeningLounge — a custom-built mp3 store I set up for him a couple of years ago. Each of these ten instrumentals draws a picture, and each picture tells a story. It’s music as a smell that triggers unexpected memories. India, 1978… Granada, 1992… each track has a strong atmosphere of time and place, like the journal of an itinerant poet or painter.